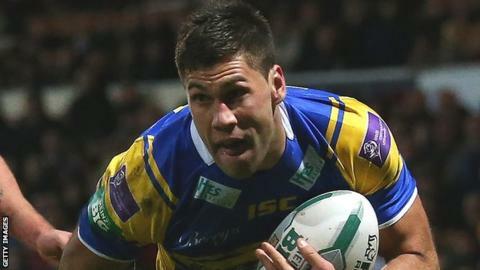 Joel Moon scored two tries against his old club as champions Leeds inflicted a third straight defeat on Salford. Tries from Stevie Ward, Moon and Kallum Watkins, all converted by Kevin Sinfield, put Leeds in control before Ashley Gibson scored for the visitors. Salford's Niall Evalds went over after the break, but Moon quickly responded. Replacement Paul McShane scored back-to-back tries for Leeds, with Sinfield also going over, while Gibson's second try was a late consolation for Salford. Sinfield's seven successful penalties from seven, added to his last-minute try, earned him an 18-point haul. But there was bad news concerning the fitness of full-back Zak Hardaker, who could be out of action for up to six weeks with a thumb injury. Leeds, whose next game is their World Club Challenge at home to Melbourne next Friday night, went ahead when Salford dropped the ball in the scrum on the line and Ward went over with ease, Sinfield kicking the extras. The visitors responded well with a sustained spell of pressure, but they were unable to fully breach the Rhinos defence. Both sides were making errors but Moon pounced onto a loose ball, while Hardaker set up Watkins in the corner, with Sinfield landing both conversions as Leeds unconvincingly went 18-0 ahead. Salford scored only their second try of the season as a well-worked move saw Gibson go over, converted by Marc Sneyd, to close the gap to 12 points on the stroke of half-time. Evalds intercepted a pass to run powerfully over the line at the start of the second half to give Salford hope, but two tries in 60 seconds ended any thoughts of a fightback. Disorganisation from Salford saw Moon score his second try, while replacements Richard Moore and McShane combined for the latter to go over and Sinfield kept up his 100% kicking record. McShane dived over for his second try, Sinfield landing his sixth conversion before scoring his own try following more sloppy play by the visitors. Gibson's second try of the night, sandwiched in between, was merely a consolation for Salford. "It was scrappy. We didn't get to grips with the game and it was not a great spectacle. "There were times when we had lots of options and things to go at, but we overplayed. It prepared us for next week because some lads got good game time, and those are the positives. "We will take the positives and, if we had have had a shocker, we would have waved it off. We wanted to take care of what we could and we did that, to a degree." "They had a dig and put the effort it. "It was there from the first minute to the 80th minute, but there was a little bit less smartness about us at times. "We gave them three tries by dropping the ball, but they're a good side who are all playing for positions and we won't take anything from them. They scored 42 points." Leeds: Hardaker; Keinhorst, Watkins, Moon, Hall; Sinfield, McGuire; Leuluai, Burrow, Jones-Buchanan, Ward, Clarkson, Ablett. Replacements: Moore, Kirke, McShane, Achurch. Salford: Murphy; Broughton, Gibson, R Williams, Evalds; McGoldrick, Sneyd; Jewitt, Howarth, McPherson, Ashurst, Dixon, Neal. Replacements: Owen, Boyle, Gledhill, James.